�Fall Impressions� Glass Photo Coasters -Set of 2 - EconoBride - Budget friendly wedding favors. 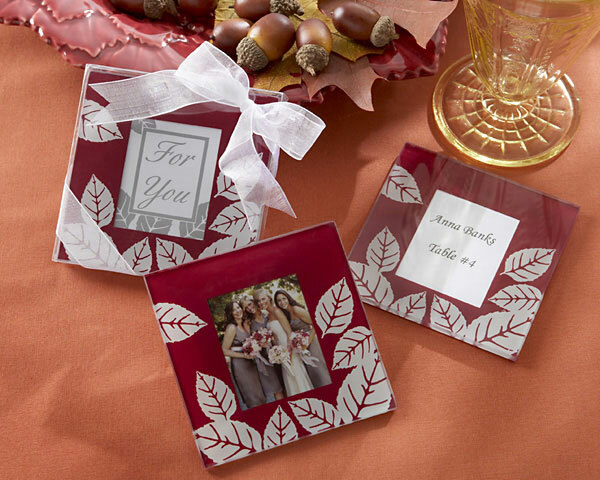 You only get one chance to make a lasting impression and when presentation is crucial, give these lovely �Fall Impressions� glass photo coasters. These practical and elegant coasters leave guests with the wonderful memories of fall and the romance of the evening. With imprints of fall leaves, the rich burgundy coasters add flair to any Autumn wedding reception, bridal shower or outdoor event. Photo coasters are crafted of heavy glass, with four padded "feet" to protect surfaces and can later be used by guests to insert their own photos. Photo coasters can be used in any number of ways at the event: framing a photo of the happy couple, as a placecard holder or simply displaying the beautiful "For You" message to guests. Each favor is packaged as a set of two coasters and measures approximately 3.5" x 3.5" and fits photos approx. 2" x 1.75".